Died February 9, 2019, beloved husband of Georgie, loving father of Kim, Julie, Donna, Alison and the late Tommy, devoted grandfather and great-grandfather. Funeral Service will be held from his home 2E Caledon Street on Wednesday 13th at 2.30 p.m., and afterwards to Roselawn Crematorium for 4pm. Family flowers only please. 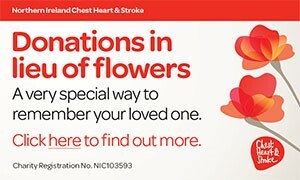 Donations in lieu, of flowers, if desired to NI Hospice c/o Stephen McCosh Funeral Directors, 117 Shankill Road, Belfast, BT13 1FD. Deepest symapthy to our friend Donna on the loss of her much-loved father. Deeply regretted by sister Avril, husband Bill and family. I am sorry to tell you that Thomas McAULEY has passed away.